My apologies to Leopard users, there is currently a glitch which will cause the app to crash for you, I’m on the case and it should be fixed shortly I’m afraid the app will be Snow Leopard only from now on, OS X 10.6 and above are required. HI Irak – that’s right, as stated in the blog post the app’s not working for Leopard, which btw is OS X 10.5.x. The current release of DorisDesktop is only working for Snow Leopard, ie 10.6.x, I’m working on a fix for older versions of OS X.
Hi, Demian. Tnks so much for the reply. Keep the good work. 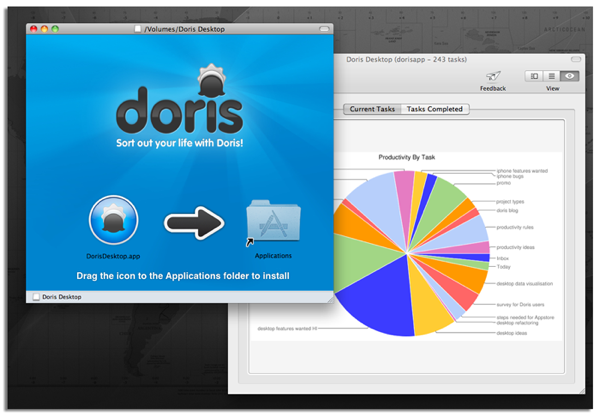 I’ve been a Doris user for a while (01/25/2010 according to my profile), and I’ve converted many colleagues to Doris. And I’m still a happy Doris user. I love the idea of a desktop application but… why can’t I submit a form by hitting enter? This is one of the most stupid UX idea I’ve ever seen. Please, change this. (SL, qwerty accentuated keyboard if this helps). I updated the UI so the return key now submits for adding new tasks, I’m expecting the next release out in the next few days. But we’re going to be Snow Leopard only now, I hope you’ve updated? I’m using Snow Leopard and plan to switch to Lion beta very soon as I’m developing apps. BTW, i you need beta testers for iOS5 on iPhone, please ask. Cool. Going to add a few more fixes to DorisDesktop before pushing to the appstore, then the next objective is to bring the iphone app up to speed, it needs some TLC!